Jewish Women’s Fund of Atlanta utilizes strategic grant-making to expand opportunities in the lives of Jewish women and girls. Our grants provide sustainable benefits to those we serve and empower Jewish women and girls to be leaders, philanthropists, and decision makers. Each year, JWFA accepts proposals from potential Grantee Partners and makes allocations according to a group decision-making process. Unlike other organizations where a small committee determines funding allocations, Jewish Women’s Fund of Atlanta prides itself in maintaining a “one woman, one vote” policy, whereby each Trustee has an equal opportunity to participate in the grant-making decisions. Atlanta Jewish Academy, Women in STEM Career Fair Initiative – This pilot program will increase access to and interest in careers in STEM for Jewish women and includes a one-day career fair with year-round mentoring opportunities for female high school students in Greater Atlanta. It provides access for the students to meet with women who have a variety of careers in STEM fields and to learn about STEM-based college curricula and career opportunities with the additional benefit of mentorship opportunities. jGirls Magazine, General Operating Support – jGirls is an online magazine written by and for self-identifying Jewish teenage girls across all affiliations. jGirls users are empowered with leadership skills, self-esteem, sense of identity, and engagement and status within the Jewish community, while building a pipeline to a future cohort of bold, committed Jewish female leaders. JumpSpark (Atlanta Jewish Teen Initiative), Strong Women: Know Them, Be Them – This pilot program will connect teen participants with strong female role models across a spectrum of business, medicine, art, and law through full days of learning, community mentorship, and empowerment. SOJOURN, Early Development of Gender Equity – This pilot program works with kindergarten and first grade students, teachers, and parents throughout Atlanta’s Jewish community to break down gender stereotypes and allow children to reach their highest potential while eliminating gender inequity. TrueChild, JET: Jewish Girls Empowered Together – Through a partnership with JF&CS, JET will teach middle school girls to think critically about rigid gender norms, particularly in having more constructive ideas around female leadership, strength, and self-efficacy. WePower, General Operating Support – WePower operates ongoing leadership training programs to proactively promote women’s leadership and gender parity in the public and political sectors of Israel. WePower locates potential women leaders and encourages and motivates them to pursue leadership roles by providing them with tools, know-how, and networking platforms. Yeshivat Maharat, Leadership Development Curriculum –Yeshivat Maharat, the first yeshiva to ordain women as Orthodox clergy, uses a two-pronged approach to leadership development, first grounding students in the theory of leadership and then giving them opportunities to apply leadership skills to the types of challenges they will encounter as future community leaders. ATZUM, Task Force on Human Trafficking and Prostitution –TFHT aims to eradicate human trafficking into and within Israel by promoting the passage of new legislation to criminalize the purchase of sexual services and protect the prostituted person. Center for Women’s Justice, Legal and Social Activation Project for Women’s Rights – CWJ will utilize bolstered litigation initiatives, educational outreach, and public mobilization to achieve equality and dignity for Jewish women in Israel in the face of the control of the religious court. CWJ’s unique strategy uses civil law to identify, challenge, and eliminate infringements on women’s rights by setting key precedents with the potential to overhaul institutionalized, systemic injustice. HaMidrasha, Leshma – Leshma works with both men and women in pre-military academies to instill an equitable gender perspective that will inform their emerging Jewish identities and inspire a commitment to social activism in their present and future leadership roles. As the participants challenge their preconceptions of gender identity, there is reduction in sexist and homophobic speech and a distinct increase in the expression of women’s voices and perspectives. Makkom, Our Place: Young Women Leading Social Change – The project encourages the leadership and social activism of young women from vulnerable populations. In a series of meetings between the young women and law students, they will choose issues from their own life experience, perform legal and social research, offer methods to promote relevant social change, and start implementing those methods. Women’s Spirit, Breaking the Bind – Breaking the Bind advocates for change in fundamental Israeli policies and laws that undermine, destabilize, and weaken women’s financial security and personal safety, especially survivors of violence. It sheds light on the invisible violence women suffer after they are no longer considered victims, as well as the pain and setbacks caused by systemic injustice and outdated laws. Jerusalem College of Technology, Women’s Entrepreneurship Program – This initiative engages religious women in business classes, creative thinking workshops, coding events and Hackathons, and mentoring, thereby increasing their earning potential and business acumen. Jewish Women’s Funding Network, Women and Mothers at Work: Gender Transformative Employment Policies – This is a collaborative grant with 14 other Jewish women’s foundations from around the U.S. The program supports collaborative and effective efforts for women’s rights and gender equality in Israel, with a focus on labor rights. JobKatif, Achotenu: Academic Nursing Program for Ethiopian-Israelis – Achotenu empowers young Ethiopian-Israelis to follow their educational and career aspirations of becoming nurses and thereafter establishing a stable financial future, while serving as role models for their community. Lilith Publications, Emerging Feminist Writers Program – Lilith will expand the number of new Jewish feminist voices they publish by identifying and developing working relationships with 20 new writers of diverse backgrounds, all of whom will apply a Jewish feminist lens to their subjects. Van Leer Jerusalem Institute: Center for Advancement of Women in the Public Sphere, The Gender Index – The Gender Index is an innovative monitoring and tracking tool that tracks the trajectory of gender inequality over time in a wide range of domains. It targets decision-makers and policy-shapers and is designed to provide detailed, extensive data on the state of women in Israeli society to inform policy decisions. Yozmot Atid, General Operating Support – Yozmot Atid supports economic independence for women from diverse sectors of Israeli society so that they can transform their lives and break the cycle of poverty by establishing micro-businesses. The program provides low-income women with a comprehensive set of tools to advance their business plans, including high-level mentoring and micro-loans. Click here for a full 2016 Grant Snapshot. Click here for a full 2015 Grant Snapshot. Click here for a full 2014 Grant Snapshot. Securing the Rights of Single Mothers, Association for Civil Rights in Israel – ACRI will work to advance the rights of mothers in the welfare system by anchoring guidelines for custody hearings in legislation, institutionalizing a fair due process, regulating the powers of authorities in such hearings, and raising awareness about the issues mothers face when confronting the welfare system. Tikkun Olam: Repairing Our Relationship with Food, Body and Ourselves, Eating Disorders Information Network – EDIN will address the problem of eating disorders in the Jewish community by creating and implementing a specialized curriculum that empowers women and girls to develop their sense of worth and value apart from their body shape and size. Ehete Center: Resource Incubator for Economic Initiatives by Ethiopian Women, a partnership of Achoti and the New Israel Fund – The Ehete Center is a cooperative for low-income Ethiopian-Israeli Jewish women to sell traditional crafts and improve their financial literacy with a goal of fostering economic independence. Securing Israel’s Future Through Employment, ITWorks – IT Works increases the employability of low-income and unemployed Ethiopian-Israeli Jewish women by imparting finance training, soft skills workshops, and job search support. Alma Community Center for Young Women’s Leadership, Jewish Agency for Israel – This brand new Jerusalem center will provide tools and support to at-risk teenage girls to enable them to find their own voice, set their own goals, and build a future of commitment, action, investment, and perseverance. Change the Culture: Sexual Assault & Dating Abuse Prevention and Education at Emory University, Jewish Women International – Change the Culture is an innovative, multi-faceted, co-ed program that promotes the safety of students through an exploration of campus culture, sexual assault, and dating abuse. By partnering with Hillel, ZBT, and SDT, the program seeks to change attitudes, support survivors, and engage men as allies. Interest-Free Loans for Secondary Education, Jewish Educational Loan Fund – Provides Jewish women in Atlanta with last-dollar loans to attain the degree they need to be successful in life. Shalom Bayit Teen Domestic Violence Prevention Initiative, Jewish Family & Career Services – Increases awareness of teen dating violence in the Jewish community and empowers young women and girls in Atlanta to make healthy relationship choices. 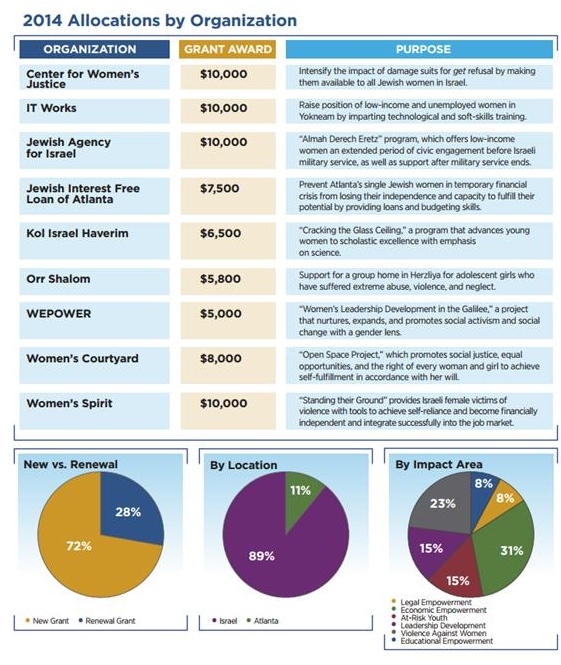 Women in Crisis Fund, Jewish Interest Free Loan of Atlanta – Prevents Atlanta’s Jewish single women in temporary financial crisis from losing their independence and gives them the capacity to fulfill their potential by providing loans and budgeting skills. Cracking the Glass Ceiling, Kol Israel Haverim – Through participation in this five-year program, low-income junior high and high school girls receive the tools they need to expand their opportunities in STEM fields. The program utilizes role modeling, empowerment workshops, and training in partnership with high-tech and bio-tech companies throughout Israel. Resetting Jewish Women’s Body & Self-Images, Limmud Atlanta + Southeast – Explores historical, cultural, and psychological challenges facing modern Jewish women and girls as they develop a healthy and realistic body image, through a series of facilitated, intergenerational, cross-denominational, and mixed-gender discussions. Financial Empowerment Program for Haredi Girls and Young Women, Mesila International, Inc. – Mesila integrates specially-developed curricula in junior high schools, high schools, and religious women’s colleges, educating students with knowledge and skills to take responsibility for their financial future. Agunah Prevention Initiative in Atlanta, The Organization for the Resolution of Agunot, Inc. – ORA informs students, community members, and rabbis about the plight of agunot, reframes get-refusal as a form of domestic abuse, and seeks to establish the signing of the Jewish prenuptial agreement for the prevention of get-refusal as a community-wide standard. Project Talya, The Society for Advancement of Education – Project Talya is an intensive 5-year course of study that operates in partnership with the Jerusalem College of Technology. Participants are highly capable intellectually and academically and earn both a high school diploma and a B.S. in Computer Science by age 19. Girls Lead:A Theater-Making Workshop, The William Breman Jewish Heritage Museum – Provides Jewish girls in the metro Atlanta area with tools to become authentic, assertive, and self-aware leaders. Supporting and Empowering Adolescent Girls at Risk, Orr Shalom – Provides adolescent girls who have suffered extreme abuse, violence, and neglect with a safe and loving home in order to help them recover from their traumas and fulfill their personal potential. FOCUS (Finding Occupations, Careers, Universities, Success) Program, Temima, The Richard and Jean Katz High School for Girls – Temima FOCUS provides Jewish high school girls with guidance in choosing post-secondary options suited to their individualized interests, skills, values, and abilities through workshops, speakers, testing, and college counseling. Respect My Red/iClub, The Felicia Penzell Weber Jewish Community High School – This pilot program will prevent sexual assault, harassment, and abuse among students by helping adolescents understand healthy relationships and address disrespectful behaviors within their peer groups. Sharsheret, The Society for Advancement of Education – Sharsheret works with both younger and older high school girls in Israel, vis-à-vis a mentoring framework, to strengthen their sense of self, advance their emotional well-being, and build their leadership skills. Women’s Courtyard promotes social justice, equal opportunity, and the right of every woman and girl to achieve self-fulfillment in accordance with her will.